This week on Survivor, Boston Rob deftly guided himself and his alliance through the field of landmines that is voting out one of your own. In the process of pushing his own agenda, he was able to convince the people voting with him that what they were doing was in everyone’s best interest. The most impressive part is that no one had any idea he was even doing it. Certainly Rob got some help in his effort to make Matt or Andrea out to be the alliance black sheep. Matt made things a lot easier for him by shaking hands with the Zapatera tribe after losing their second consecutive challenge. Whether it was an irksome gesture in the eyes of his teammates or not, Rob now had the ammunition he needed for his plan. However, you got the sense that he was going to figure it out one way or another regardless. Very early in the episode Rob pointed out to Natalie the danger of the budding relationship between Matt and Andrea. He was planting the seeds with Natalie early so that when the pair talked to Ashley and Grant, the concept of voting Matt out because he was dangerous came off as an observation rather than Boston Rob’s evil plan. How would Boston Rob have handled the situation had Matt not shook hands with Zapatera after the challenge? Would things have gone as smoothly? Probably not, but Boston Rob would have likely convinced the other three that Matt needed to be voted out anyway. He just would have had to work a little harder. A question that remains is why did Boston Rob have Phillip vote for Kristina (awesome methodology, by the way)? My guess is that Boston Rob is thinking ahead to 30 minutes later when they’re back at camp and Rob has to explain to Andrea why they voted Matt out, didn’t tell her, but still keep her on their side. One thing that I come away with from this episode is the difficulty of letting new players play with experienced ones. The ultimate example of manipulation came in Survivor: Fans vs. Favorites when Amanda and Parvati convinced poor Erik to give up his immunity idol and was subsequently sent home. This week we watched Natalie blindly follow Rob’s implication about her tribe mates while the rest of the alliance couldn’t see the forest for the trees in Rob’s plan to get rid of Matt. 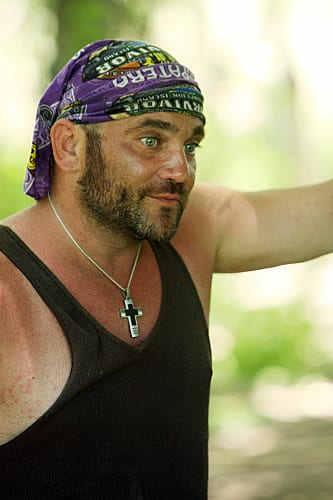 Similarly with Zapatera, Ralph somehow doesn’t understand how to handle Russell hiding the clue to the hidden immunity idol. As arrogant and annoying as Russell may be about Ralph challenging him, he’s right! Forget Russell’s insidious insinuations about Ralph challenging him. What did Ralph have to gain by doing so? What did he accomplish? Ralph already has the idol, so it’s not like the clue has any value to him. He was attempting to intimidate Russell in to looking bad in front of the tribe while not being 100% aggressive himself. We’ve all seen Russell play, how did he think that was going to go? Russell was just going to give up the clue because he got caught? For my money, I would have just kept my mouth shut. Listen to Boston Rob: “You (amateurs) don’t know when to keep your mouth shut.” Amen, brother. Russell would have looked far more foolish when the self proclaimed King of Idols didn’t find the idol, even after potentially multiple clues. I’d suspect that people might turn against him thinking his success in prior seasons was more luck than skill. However, if you’re going to go after Russell, do it 100%. Rather than politely asking if he’s got the clue, just flat out say “Russell, I know you have the clue and you need to show it to all of us.” Russell’s going to call you a liar, but who’s going to believe him? Besides, clearly other people a) saw him initially take the clue and b) transfer the clue from his sock to his waist (you can see David watching him as Ralph does). There’s little to worry about there. Russell’s not going to go away with passive aggressive. Boston Rob made that mistake in Survivor: Heroes vs. Villains. To get rid of Russell, someone is going to have to knock him down a peg, make him question his plan. It’s going to require the backing of the tribe and they’re only going to back someone who seems like a serious player. Politely questioning Russell is not going to accomplish that. Great week for quotes if you haven’t checked them out already. Boston Rob in particular was on fire. The only downside to Matt going home is we don’t get more of his hilarious impersonation of an Australian narrator for Phillip’s hunting antics. Does Phillip know how chauvinistic he is? The tribe is going to keep him around because “he’s a strong MAN”. He revealed his former job so the girls would know he’s trustworthy. Why wouldn’t the guys realize that as well (if it were true)? I wonder if you have to pick the order of who’s doing what in a challenge ahead of time and its set in stone. If I were Boston Rob, once we got the lead, I would have switched with someone to throwing the balls (presuming I could). His frustrations at watching Phillip fumble with the balls much have been through the roof. If we’re forced to see clips of the losers at Redemption Island beyond the challenges, I’m voting to get rid of the idea already. This week’s clips of Francesca were useless. Rob did a hilarious job of coaching Phillip through how he needed to act at tribal council. To his credit (and my amazement) Phillip came through with an Oscar-worthy performance.